A summary of today’s show: Bob Rice—professor, speaker, youth leader, musician, and author—talks with Scot and Fr. Matt about the challenge of reaching out to youth, not just to fill them with information, but to form them in a transformation and a life-giving relationship with Jesus Christ. Bob has also written a new novel that lets us walk with St. Peter through the Gospels. 1st segment:Scot welcomes Fr. Matt and noted that Fr Matt and his team at Office for the New Evangelization of Youth and Young Adults have been working very hard. They had the Eucharistic Congress last weekend, the Youth Ministry Awards Dinner last night, and three more events this week. The Congress was fantastic, he said. They had more than 500 participants and they had a huge turnout from colleges. The powerful aspect of this weekend was the focus on Pope John Paul II. All of the talks drew on his teachings. See the photos on Flickr.com/BostonCatholic. They had the vocation monstrance blessed by Pope John Paul II, and the College of St. Mary Magdalene Choir sung during the procession through the streets of the North End. Some people who saw this were moved to tears, some were mocking, but most were awed by what they saw. Some participants were assigned to go up to the people watching and introduce them to what was going on. Last night was the Awards Dinner for Youth. They are trying to tell the story of the good news that is going on among youth in the Archdiocese. The dinner has been going on for more than 50 years, but it was reinvigorated over the past few years. Last night they gave out more than 100 awards to youth and adults. 2nd segment: Scot and Fr. Matt welcome Bob Rice to the show. Bob will be in Boston this week for three different events. On Thursday, 9am-3:30, a catechesis on adolescent catechesis; on Thursday night, 7 pm, City Side Bar in Brighton, Theology on Tap; and on Friday, a mini-retreat day for anyone who ministers to youth. The symposium will be for those involved in passing on the faith to young teenagers and talk about the keys to catechizing young people today. The goal of catechesis is intimacy with Jesus Christ. Many times we have a classroom stereotype of religious education, but while it can be done in the classroom, the goal of catechesis is transform lives. The heart of catechesis and how we can bring young people to conversion in any setting. He travels around the country about once or twice per month bringing this message of catechesis to people working with youth, as well as doing this as his full-time job at Franciscan University, teaching catechesis to college students who will go out and do the same. The first talk will jump off from St. Paul in Romans where he said that the goal is that we need to transform our mind to God’s will so we know what it is. So often in catechesis we train them in what to think, not how to think. We often fill them with information but we don’t give them formation. Effective catechesis asks how we can gear catechesis that isn’t just informational, but transformational and lead to deeper intimacy with Jesus Christ. The last talk is a wake-up call. It isn’t all about us. God doesn’t care what we do for Him. He cares about what we are for Him. Many times, as catechists, we can get caught up in replacing our own spirituality with the ministry we do and we miss the very intimacy that we’re trying to lead young people to. The Theology on Tap’s theme is “You’re going to die and other good news.” Bob said that we live in a society that tries to avoid death. We are shocked by it, even though it is the most natural thing in the world. In our faith it is not something to be afraid. God has revealed some pretty good news about it. We should be prepared for it. The everlasting life we should want to live and the everlasting damnation we should want to avoid; what is heaven, what is hell; purgatory: This is what will be covered. Bob and Scot joked that you need one or two beers to understand eschatology. Fr. Matt said the Eucharistic Congress this past weekend promoted the Theology on Tap as a great followup for participants. He said we often hear people say that they are “spiritual, but not religious.” He asked Bob how you begin to address that with young adults. The big question is what they mean by “religious”? What he thinks they often mean is a focus on rituals and an experience of God that doesn’t speak to their heart, and sadly every major Christian denomination, including Catholics, can be guilty of falling into a ritualism that doesn’t invite people into greater intimacy. Of course, what the Church teaches is far from that. Receiving the Eucharist should be one of the most intimate things we can do. Sometimes that not the perception because we haven’t reached out to young adults very well. They would rather have the unstructured one-on-one relationship with God. What we need to show, as catechists, is that God dwells among His community. The sacraments are a way to deeper intimacy with God. Theology on Tap is right in line with John Paul II’s message that we need to engage the culture where it’s at. He will be only speaking about what the Church actually teaches, not his speculation on what heaven is like, and it is amazing. The distinction between spiritual and religious can fade and you can become someone who is spiritually religious. Fr. Matt said he has had good conversations with both a Hindu and a Muslim and when you talk to them about the practice of their faith an how their parents practiced their faith, they have the same line as many of the Catholic young adults: “I’m spiritual, not religious. I don’t need to go to a temple to worship God.” It’s something epidemic in Western culture. Scot asked whether it’s becaue of the hyper-individualism in our culture, where people don’t want to be part of a larger organization that has rules and tough requirements, as any rigorous religion would ask. Bob said another part of the equation is rampant consumerism. A lot of young people treat community like consumers. Especially with social media, we can block out people we don’t like and connect with people we do like to create a false sense of community and become illiterate about communicating with each other. So we walk into a church and if we don’t like the priest or we don’t like the person sitting next to us, then everything in society would tells us to find a new priest, find a new person to sit next to; You can better on your own; you can customize things to yourself. This is a whole consumer market driven at young people. So it makes sense they see religion that way. They don’t want to sit through a homily that’s too long or listen to a homily they don’t agree with. We’ve taught them have zero tolerance for anything that doesn’t satisfy them, in any kind of relationship. (This is why we have problems getting them to marry each other.) This affects relationships in community and a relationship with God, as in the real God, not God as they would hope Him to be. Scot asked Bob if talking about the End Things helps people to put things into proper focus since our society avoids thinking about death. Bob said the more society avoids talking about death, the more of an unreal life we live. He’s had opportunity to do mission work both in Mexico and Haiti, and death is very prevalent. In Haiti, you are confronted with the reality of the shortness of your life. If you think you’re immortal, then you have really weird thoughts about heaven and hell. Death is final. You can have an opinion about heaven, but the only opinion that counts is the one from the only Person who died and rose from the dead. Whether you like it or not and no matter what you believe in, there is going to be a reality to heaven, hell, and purgatory. God revealed all these things in His love so we can be prepared for it. Fr. Matt thinks of his parents how were catechists for many years and he was a catechist himself and he struggled with the apathy among the young people he encountered. How does a catechist break through the religious apathy? Bob recalled that Pope Paul VI said in Evangelii nuntiandi that “Modern man listens more willingly to witnesses than to teachers, and if he does listen to teachers, it is because they are witnesses.” Young people need to first encounter someone who has a transformed life because they have encountered Jesus Christ. Sometimes we have people in our parishes who don’t feel equipped to share their witness, so they just go by the book and don’t open up about what God means in their life. If the young person doesn’t see incarnate what it means to follow Jesus Christ, then everything else is just academic. We also need to inculturate the language, to speak in ways that young people understand, to not be afraid of culture. We need to engage and find where God is present in it and build a Church within it. We often speak a churchy language, and don’t use the elements of their own culture that points to God’s love for us. 3rd segment: Scot asked about someone who wants to be the best catechist they can be, but aren’t sure how to relate to young people because they’re 50 or 60 or 70. How do you equip yourself? Bob said that to start with you should go to the Adolescent Catechesis Symposia sponsored by Office for the New Evangelization of Youth and Young Adults. There is a bit of training involved though. You can’t approach it lightly. The General Directory for Catechesis says, in terms of working with young people, that we need to have more of a missionary attitude toward young people than a strictly academic one. Sometimes we jump right into catechesis but we never approach them as a missionary. A missionary learns about the culture, lives among the people, speaks their language. That can be difficult, but it needs to be done first. There is no shortcut. Otherwise we read from a book and the teens are bored to tears. You need to be part of the culture: Listen to the music young people listen to, watch TV shows they watch, read the books they’re reading. It is part of your homework. You don’t need to watch an entire season of a show, but you can watch one episode. If you work with young people, but haven’t read “Twilight” or seen the movies, you’re missing out on a cultural opportunity to shgow where God can be found in that. Some people want to say that everything in youth culture is evil or wrong, but culture is made by men and women who are made in the image and likeness of God. In the Second Vatican Council document Ad Gentes, which was about missionary work, it said we need to live among people so we can “lay bare the seeds of the Word which lie hidden among their fellows.” Those seeds are in the culture and we need to help them see that. Fr. Matt said we often look at culture or the world and we say “bad”. But a Catholic viewpoint looks at culture and the world and see the things that are good, beautiful and true. Working with young people to be able to see those things, how can we see instead how to use those things for good? Bob said that certainly there are things that are bad in culture, but when we critique culture, we critique the young people because they are intimately connected to it. When we can find what is good in the culture then we can say what it is good and bad. We can help them be more literate in understanding the messages that the media is giving them. A young person spends on average about 8.5 hours per day with media. We have to help them understand what kind of messages they’re digesting. Rome itself shows how the Church didn’t run away from culture, but transformed it, right down to churches that used to be places of pagan sacrifice. Pope John Paul II used to say that we need to impregnate the culture with the Word of God. Scot said he’s been amazed while reading Pope Benedict XVI’s comments on new media and Bishop Ron Herzog of the US bishops’ conference Committee on Communication, who said, Facebook has changed not only the way people receive and share information, but how they communicate. He asked how much of getting to understand young people involve using these new media tools? Bob said it’s absolutely essential. When you have media, you have a new language which is limited. Communicating the Gospel through Facebook isn’t easy. It’s almost easier to communicate Shakespeare with smoke signals. There’s a depth to the message that the medium doesn’t allow us to connect. So we can use social media in a way that preaches the Word of God through actual relationships. We need to pull them into a place where they can experience real community and authentic teaching. But that’s another stage of evangelization. We need to go where they’re at first. Pope John Paul II said in Redemptoris Missio that we need to have the media communicate Gospel values, not just merely as a preaching of the Gospel message. We need EWTN, but we also need to find a way to get Catholic values on NBC and Fox and TV shows and novels and music. Not just praise music, but we need to be thinking bigger. 4th segment: Bob has many talents. He has released 8 albums. He said he has been blessed with music. Currently he leads all the worship music for the Steubenville summer conferences, both adult and youth. It’s been a passion of his. He’s planning to sing a little at Theology on Tap. Fr. Matt recalls when he was a seminarian and serving an internship at Immaculate Conception in Newburyport that Bob and Bob Lefnesky came in during the youth group’s 30 Hour Famine to do a show and some comedy skits. Fr. Matt is always struck by how deeply theological and biblically based his music is, how it gives glory to God, and teaches the listener some aspect of a relationship with God. Bob said that is his aim. He loves the ancient hymns. They were just doctrine put to music and stirred the soul, because doctrine is just something about who Jesus is. Scot asked how he goes about writing songs? Bob said songs usually come to him when he’s supposed to be doing something else. They just hit him. They usually start with a phrase or thought that connects to an emotion or a thought about God. He writes a lot of bad songs that no one ever hears. He doesn’t sit down to write songs. Recently, Bob took on a project to write a novel about St. Peter’s relationship with Jesus, “Between the Savior and the Sea”. It’s the Gospel story from Peter’s point of view. All of the Evangelists spend a lot of time letting us get to know Peter and question is why the Gospels say so much about Peter. In all of Scripture gives us the most detailed version of what it means to follow Christ. Bob did a lot of research and even went to the Holy Land to get everything accurate, right down to the food and buildings. Scot asked how Bob integrated the words of Jesus from the Scriptures into the book? Bob anchors the book on all the Gospel stories. He would write narrative bridges between those Gospel stories. For example, when the disciples were sent out two-by-two, we don’t know where they went or did, but in Bob’s novel we follow Peter on his journey and see what it was like for him to preach the Gospel and heal someone and cast out a demon. But then they go back to the feeding of the five thousand. The book weaves in and out of what we see in Scripture and the narrative bridges that the Gospels don’t care. He did it in a way that’s faithful to Catholic doctrine and who Peter was. Ideally, it gives an accurate depiction of the Gospel stories and will inspire someone to read the Gospels themselves. Fr. Matt asked what inspired Bob to write this novel and who his intended audience is. Bob said he hopes it appeals to all ages. When Bob goes out to speak and preach, he tries to use his theatrical background to bring the Gospel stories to life. These stories tell us who God is. After doing this for a long time, he decided to try his hand at writing the Gospel stories, but in his first attempts he was stunned at how many stories he had to put in between the Gospel stories to make the narrative cohesive because the Gospel was not written in a narrative style. It took about 3 years and he’s never worked harder on anything. Scot asked Bob how his devotion to St. Peter was affected by these 3 years of spending so time reflecting on his life. Bob said he was so sad as he wrote the last page because he had been walking the streets of Galilee and Jerusalem with Peter and Jesus and all the apostles. It brought him closer to all the apostles. He tried to flesh out each of the 12 apostles as individuals with all their strengths and flaws of character. It became a community which he got know and walk with. As he walked away from the book, he also had to recognize that these characters were not really the apostles. He couldn’t fall in love with his own fictitious version of who he thought they were. It could have been who they were, but there’s a greater depth to a person than can be found in a novel. So in his relationship with Jesus he wants Him to be bigger than the book and the words on a page. Bob didn’t invent any new flaws for St. Peter beyond what is found in the Gospels. If anything he tried to show what kind of heroic virtue St. Peter had. Sometimes we think of him failing, of sinking in the water as his faith wavered, but we don’t reflect on, hey here’s a guy who walked on water in the first place. Here’s a guy willing to fight to for Jesus in the garden and followed Jesus into the courtyard when everyone else ran away. He’s an exceptional man of God who had an exceptional call, but like any of us he struggled between his divine call and his human will. Bob said he always wondered why Jesus told Peter that he would deny him three times and Peter said he would not, then turns around and denies him almost right away. As he was reflecting on the story, Bob realized that when Simon Peter was in the garden and he was swinging his sword at the high priest’s servant, he was willing to give his life. It was probably ringing in his mind that he would not deny Jesus, that he would give his life for Him. And he dove in there alone. Maybe he was stunned that Jesus told him to stop and perhaps he considered that he’d already proven himself against the denial. Then in the courtyard, the encounter with the slave girl and others came as surprise: “Wait, this was the test?” We can often be geared up for the big battles in our life, but it’s the small things where we fall and fail and where we end up denying Christ. We can be great Christians on retreat or in youth group, but what we do when we’re alone on the computer or among friends and things go in the wrong direction? But like Peter, Christ always calls us back with love. On the mini-retreat day on Friday for people who work with youth, it is important know that it is a retreat, not training. It is a time for youth ministers to be refreshed in their own faith, to be with others in similar ministry to encourage each other and strengthen each other. It’s not too late to sign up at the Office for the New Evangelization of Youth and Young Adults website. 5th segment: It’s time to announce the winner of this week’s WQOM Benefactor Raffle. Our prize this week is a copy of “Time for Mercy,” a film narrated by Joseph Campanella. This award-winning video explores signs of God’s mercy in our time, and takes an unflinching look at the biblical witness of God’s judgement and mercy, the offer of God’s mercy in Christ, and the troubles of today’s world. This week’s winner is Mary Boudreau from Norwood, MA. Congratulations Mary! 6th segment: Tonight is the fourth Wednesday of The Light Is On For You. Every Church in the Archdiocese is open from 6:30-8:00pm tonight for Confessions. If you need to locate a church along your commute, please visit PilotParishFinder.com or download the PilotParishFinder app for your iPhone or Android device. Since Wednesday evenings during Lent are big Confession evenings, we’ll take questions submitted by listeners on the Sacrament of Reconciliation. 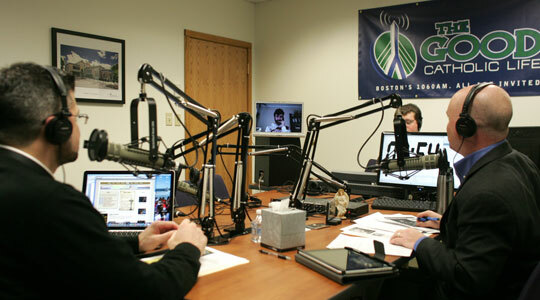 If you have a question, please email LIVE@TheGoodCatholicLife.com, text or call us at 617-410-MASS (6277). What happens if you forget to confess a mortal sin at confession? First, you have to ask if you just forgot (you were nervous or forgot to make a list) or if it was intentional. If you just forgot, God’s mercy covers that sin and you have received absolution. It’s still good to talk to the priest next time in confession about it to get advice and direction. If you hold back intentionally, that sin is not forgiven. You have to be ready to let go or be sorry for that sin. You walk away with that sin still on you. You have not experienced a full reconciliation with God. You have not been restored. You still have the stain of mortal sin and you’re not supposed to go to confession. The lesson of the Blessed Mother shows us how she was preserved from the stain of Original Sin to prepare her to be an immaculate tabernacle receiving the Lord. In the same way, we need to be purified from mortal sin in order to receive the Lord. Mortal sin kills us and wounds us in our relationship with the Lord. Scot said that embarassment shouldn’t hold you back from confessing a sin. You will not shock the priest with anything he hasn’t heard before. And then burden of a sin that you don’t confess deliberately grows even greater the longer you hold on to it. God wants to relieve that burden of you and He can through the power he has given to his priests. Tonight the Light Is On For You and it’s on because there is a priest waiting to help you be relieved of that burden.